You can work around any schedule and include fun, family, and friends into your life. You just need to know how. We share a few ways to stay focused on your work while making it all happen, including scheduling your work day, informing family and friends of your schedule, and setting time limits. How great would life be if you could work at the beach every day? Sitting in the sun and listening to the waves would be the perfect job, but the reality is that if you're on the beach, why in the world would you want to focus on working? You wouldn't be. The fact is, to build your virtual assistant (VA) business and keep your clients happy, you have to be focused on their projects and nothing else. Sure, being a VA is flexible. You can take vacations and work around your beach time schedule as long as you have a good Internet connection. But, this should be a last resort because you should want to spend time with your family at the beach without even thinking about work. And you should be dedicated to your work when you are doing it. In this fast-paced world, it seems that the ability to do several things at once is a way to judge how valuable a person is to the business. You’ve been taught to do it all, and do it all at the same time. It’s true that at times, multitasking can be valuable. It may be fine to check your email while you’re at the doctor's office, for example. But to do a project well, you need to be totally focused on that project and not have your mind distracted by the sand and waves, or the TV, social media, and other technological distractions. Schedule your work day. Schedule your day as if you had to go to an office. Keep in mind that the time you set is your own choice, but do stick to it. If it isn’t working, set a new schedule. Be realistic -- if your children will be home after 3 in the afternoon, it may not be likely you’re going to get much work done until after bed time. Inform friends and family. Tell your friends and family when you will be working so they can avoid interrupting you during work time. Every interruption takes extra time after the fact to refocus. It can be difficult to tell your family that you cannot give them attention because you're working, but if you tell them upfront it will make your life easier. Schedule fun time. Whether with friends or family, schedule time to spend with them. Working from home can make a person a workaholic if you’re not careful because the office is always there. The work may never quite feel done, but it’s imperative to spend time with your family and friends so you don't feel like you're neglecting them. Make these hard schedules in your calendar right along with hard deadlines for clients. Plan the next day before you quit for the night. If you already have a plan in place, you can get right to work each morning. 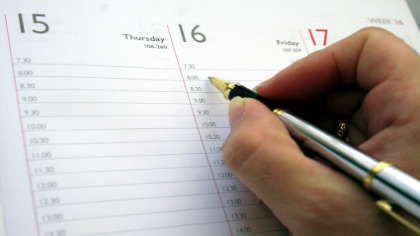 Take the last 15 or 20 minutes of your work time and make a plan for the next day. If you're using your calendar correctly, you should be able to easily see what you have accomplished during the day, and what you need to do tomorrow. You will save valuable time each morning and stay focused on exactly what needs to be done if you see your list as soon as you get to your office. Set a time limit. When you're planning your work day, make sure you schedule time for breaks. You need to take time to refresh your mind and body. Your mind works in 90-minute increments, so shoot for a five-minute break every 90 minutes, plus normal lunch breaks if your day is set up to include that much work time. Exercise. Schedule time for moving your body. This time can be especially helpful for those who work from home in an administrative capacity or who sit for long periods of time. Get up and take a walk or just go outside for some fresh air and stretching. When you come back to your office, you will be energized and ready to tackle the next item on your schedule. Working from home can be a blessing for people who are caring for children or elderly parents, but they still have to act like it's a job. If your employer or client is depending on you, your work isn't a hobby that you can do whenever you get around to it. When you learn to make schedules and create systems for yourself, you'll find there is time for everything, including the beach.